APBS is committed to increasing the diversity of the student body while maintaining high entry standards for all its students. It plans to increase both the number and proportion of international students. APBS has a clearly articulated commitment to widening participation that is an integral part of the School Admissions Strategy. APBS monitors closely the diversity of the our student body and its admissions process more generally to ensure that barriers of any type do not exist for applicants regardless of social, cultural, ethnic, religion, educational or economic background. All applicants will be given an equal opportunity to demonstrate their skills, achievements and potential. The Students Affairs Ofﬁce provides advice and practical support to all applicants to the School with disabilities. APBS recognizes the importance of diverse learning pathways in several ways, most notably through our commitment to a life-long learning agenda. Tunisia is oneof the most sought-afterdestinations in the educational ﬁeld, as it known for the quality and rigor of its universities. This is due to the Tunisian authorities that rely heavily on the reliability of Tunisian diplomas. All APBS programs have been accredited by the Ministry of Higher Education and Scientiﬁc Research. Tunisia gives between 1 to 3 months for foreigners/international students to get a residency permit. After this time they will be audited. To obtain their residency permit international students must go to the police department in the area. Before his/her arrival in Tunisia the student must have: (i) a letter of invitation from APBS and, (ii) the certiﬁcates of registration and payment, also provided by the school. 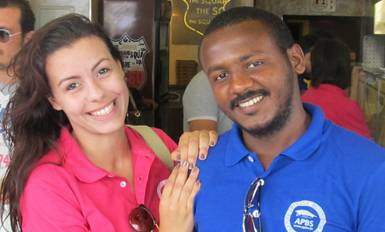 APBS supports its international students when they arrivein Tunis. The school offers a pick-up service from the airport to students apartments. However, the administration must be informed by email or by phone about: the arrival time, and the airline/ﬂight number.